This afternoon was the premiere of the movie that my son made this week with his cousins (aged six, five, one and ten months). The premiere was held at the Christmas afternoon tea and attended by all members of my family and all of the movie’s stars. The script, about a princess who would not wash and a dragon who squirted water instead of breathing fire, was written by my son. All members of the audience enjoyed the lively wit and the performances of the young stars. This project has kept my son busy all week; writing, filming and editing. The script involved the princess seeking advice from a mage. The mage provided her with some water defending hounds (our dogs will chase water), a water repelling shield on a stick (an umbrella) and a magic water coat (a raincoat). Each of these had its own problems. Finally the mage gave her a magical bar of soap and she had a shower. The final part of the movie was a blooper reel….absolutely hilarious! This was much better than any Christmas gift that we could buy. Do you think that this is how Baz Luhrman started? 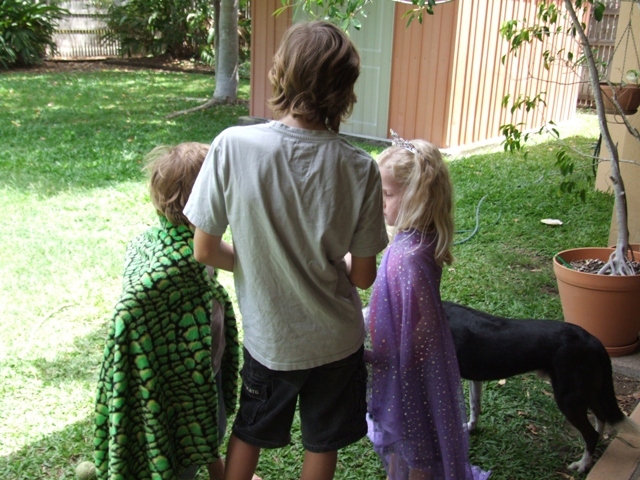 A backyard script conference. Note the costumes – just fabric held together with a safety pin. thank you for coming to visit my blog! Your son sounds very imaginative and talented too; I love the film. Any chance of it going on general release, it might make my son decide to wash occasionally! Nice to see you Flo. You have a lovely Christmas too! What a fantastic project! And an excellent storyline if I might say so. That’s the sort of thing he and his cousins will always remember doing. You’ll have to keep the footage for ever so they can screen it at the Oscars after-party.